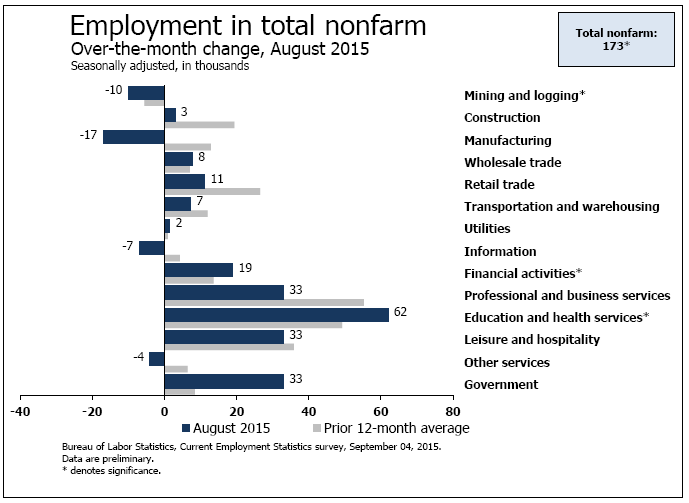 The headline may not look it but there's plenty of strength in the August employment report. Nonfarm payrolls rose only 173,000 which is at the low-end estimate, but the two prior months are now revised up a total of 44,000. 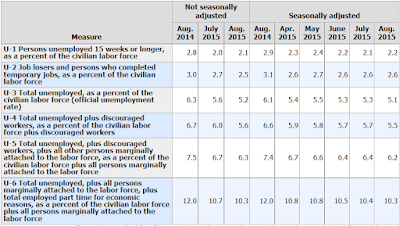 The unemployment rate fell 2 tenths to 5.1 percent which is below the low end estimate and the lowest of the recovery, since April 2008. And wages are strong, with average hourly earnings up 0.3 percent for a 2.2 percent year-on-year rate that's 1 tenth higher than July. Debate will definitely be lively at the September 17 FOMC! Private payroll growth proved very weak, at only 140,000. 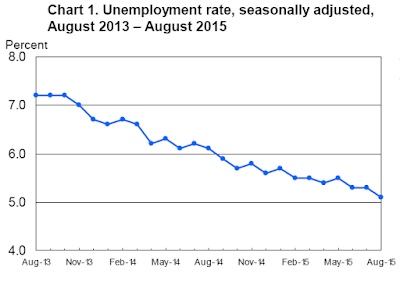 Government added 33,000 jobs vs July's 21,000. Manufacturing, held back by weak exports and trouble in energy equipment, shed a steep 17,000 jobs followed by a 9,000 loss for mining which is getting hit by low commodity prices. A plus is a 33,000 rise in professional & business services and a respectable 11,000 rise in the temporary help subcomponent. This subcomponent is considered a leading indicator for long-term labor demand. Retail rose 11,000 with vehicle dealers, who have been very busy, adding 2,000 jobs following July's gain of 11,000. 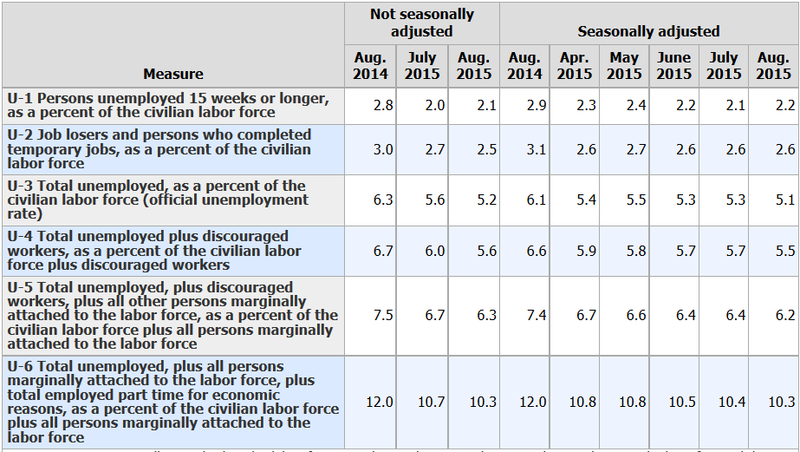 Seasonality, especially the timing of the beginning of the school year, always plays an outsized role in August employment data which are often revised higher. Policy makers are certain to take this into consideration at this month's FOMC. There's something for everybody in this report which won't likely settle expectations whether the Fed lifts off or not this month. The employment change for June revised up from +231,000 to +245,000, and the change for July revised up from +215,000 to +245,000. 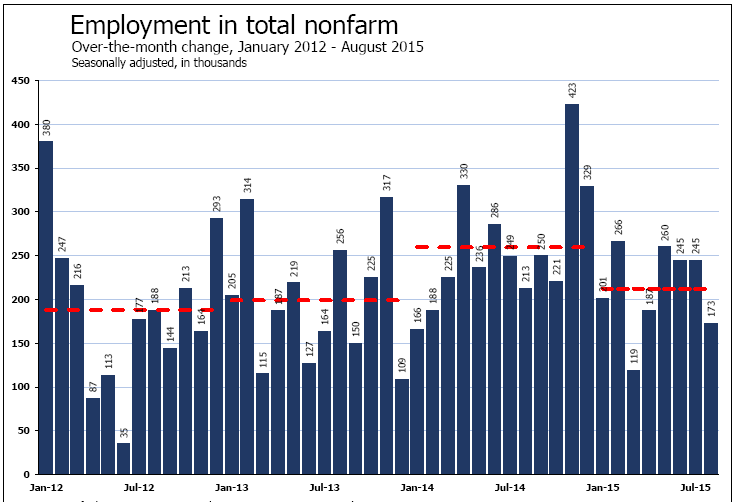 Incorporating revisions, employment has increased by an average 221,000 per month over the past 3 months. Average hourly earnings for all employees on private, nonfarm payrolls rose by 8 cents in August, following a 6-cent gain in July. Hourly earnings are up 2.2 percent over the year. 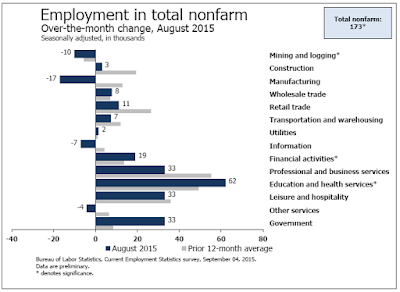 In August, average weekly hours of all employees edged up 0.1 hour to 34.6 hours. 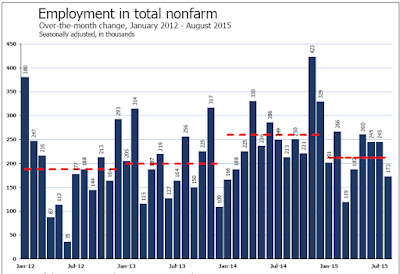 Total nonfarm payroll employment increased by 173,000 in August, and the unemployment rate edged down to 5.1 percent. Job gains occurred in health care and social assistance and in financial activities. Manufacturing and mining lost jobs. Average weekly hours of all private employees rose by 0.1 hours to 34.6 hours (from a downward revision of 34.5 hours last month) . Average weekly hours of all private service-providing employees was flat at 33.4 hours. Average hourly earnings of production and non-supervisory private workers rose $0.05 at $21.07. Average hourly earnings of production and non-supervisory private service-providing employees rose $0.06 at $20.88. The official unemployment rate is 5.1%. However, if you start counting all the people who want a job but gave up, all the people with part-time jobs that want a full-time job, all the people who dropped off the unemployment rolls because their unemployment benefits ran out, etc., you get a closer picture of what the unemployment rate is. That number is in the last row labeled U-6. U-6 is much higher at 10.3%. Both numbers would be way higher still, were it not for millions dropping out of the labor force over the past few years.